Back cover blurb: It's 1944 and Connie is a trainee 'lumberjill.' She's been transferred from blitzed Coventry to the Forest of Dean to learn the lumberjack trade as one of the women forming the backbone of Britain's war effort. She's nursing a huge secret and running from her tragic past, and will soon have to make a life-changing decision... Women like Connie are finding opportunity and liberty like never before, but in this explosive moment of history everything is changing for women ... and nothing is changing. Then, as now, is the price Connie must pay for her freedom too great? This is a novel about imprisonment and escape, about what makes a family, about solace in nature as civilisation is ripping itself apart, about renewal after devastation, about searching for safety, about love and about what personal liberty means for a woman. I must confess to being pretty ignorant about the Forest of Dean's association with the Women's Timber Corps (a separate branch of the Women's Land Army), and in fact the Forest's involvement in World War Two as a whole. I had no idea for instance that there were Prisoner of War camps in the area, pretty shocking as I don't live very far away. But it seems that the Women's Timber Corps or WTC (much like the Forest's involvement in WW2) have sadly been largely forgotten. This is one of the reasons that this book is so special! The Women's Timber Corps (WTC), was a civilian organisation created during the WW2 to work in Forestry replacing the men who had left to join the armed forces. Women who joined the WTC were commonly known as 'Lumber Jills'. Constance (Connie) is posted to the Forest of Dean after losing her previous job in a factory following a family tragedy. Connie is alarmed to be chosen to be in the WTC, she struggles in the classroom and is convinced that she will be sent away, jobless and penniless. But then she goes outside and meets Frank a forester, who is about to show the girls what they have learnt in the classroom. Connie thinks that she won't be able to put in to practice what she couldn't quite grasp in the classroom. Frank however sees that with her first attempt that Connie is a natural and quickly lobbies to keep her in the forest and not have her billeted elsewhere. Connie knows that after her devastating past she should be grateful to have a roof over her head, but she feels so alone in the strange forest, the other lumber Jill's are friendly enough, but it just isn't the same as home. The secrets she is harbouring just seem to make it all worse. Then Connie meets Seppe, an Italian Prisoner of War who is being held at nearby Camp 61, he too has secrets that he wants to keep to himself. They shouldn't like each other, the brash outspoken Connie, and the shy, retiring Seppe, but they do, almost instantly. Despite the odds, they start working together, Seppe quickly learns both the skills of the work, and when to keep his mouth shut and not aggravate Connie's moods. But in a world where the changes come at a breathtaking pace, can they really be friends, or even something more? Shelter is a beautifully written novel, obviously thoroughly researched and I can't wait to hear more from this author. 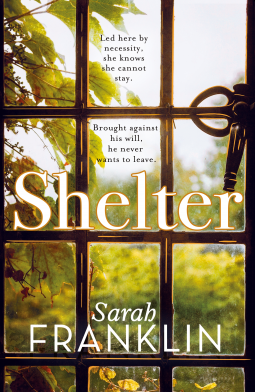 Shelter is available now via Amazon online and all good book shops. Many thanks to the publishers who approved my request via netgalley in exchange for an honest review.